We’d love your help. Let us know what’s wrong with this preview of The Mammoth Book of Steampunk Adventures by Sean Wallace. Looking to the future through the lens of the past, here is a second fantastic collection of over 30 typically anarchic mash-ups that push the boundaries of steampunk from the same editor of the bestselling Mammoth Book of Steampunk. 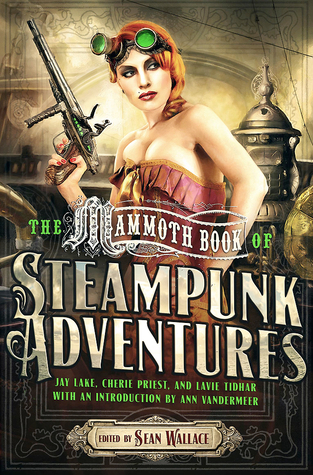 To ask other readers questions about The Mammoth Book of Steampunk Adventures, please sign up. As with most short story collections, there are usually a mixture of good ones and bad ones. In this book though, unfortunately, I couldn't seem to find one that stood out, and to be honest, they were all fairly mediocre to what I was actually expecting. The stories are all written by various authors, most of these I've never heard of. The theme of the stories are fairly grotesque, which isn't a problem. The main problem with the majority of this collection are the rather weak plots, plus the fac As with most short story collections, there are usually a mixture of good ones and bad ones. In this book though, unfortunately, I couldn't seem to find one that stood out, and to be honest, they were all fairly mediocre to what I was actually expecting. I have never read any Steampunk so this seemed to be a good place to start. There are 26 different short stories in here from stars of the genre like Cherie Priest to others that I have never heard of. As with any short story collection you do get a mixed bag. There were some really good ones that captured the essence of Steampunk perfectly, with the machines, dirigibles and automata making you feel that the time machine that you had just stepped out of had bought you to a very different world. I have never read any Steampunk so this seemed to be a good place to start. There are 26 different short stories in here from stars of the genre like Cherie Priest to others that I have never heard of. As with any short story collection you do get a mixed bag. There were some really good ones that captured the essence of Steampunk perfectly, with the machines, dirigibles and automata making you feel that the time machine that you had just stepped out of had bought you to a very different world. Others didn’t work for me, either because they didn’t have the right Victorian feel, or seem Steampunk enough. Seven stories were actually good. The rest were O.K., but not especially memorable. Details to follow on my blog. Finished "Harry and Marlowe and the Talisman of the Cult of Egil" by Carrie Vaughn, which is basically a mini Indiana Jones adventure if Indy were a woman and a princess, and I very much want to know if there's more! Also read "Smoke City" by Christopher Barzak last night, and the world building and imagery there is amazing and beautiful. "The Colliers' Venus (1893)" by Caitlin R. Kiernan has excellent world building and structure. I'm also super into the thoughts expressed about time. This collection is a mixed bag, and I'm glad of that. Stories that don't quite behave as they ought are stories written by authors and picked by editors who are pushing at boundaries. Some of these stories are not comfortable for me to read ('Five Hundred and Ninety-Nine' and 'Anna in the Moonlight', for example). The diverse viewpoints are greatly welcomed, and they add fascinating layers of conflict. I really admired 'The Clockworks of Hanyang' and 'Selim that has Grown in the Desert'. This was a pretty good anthology with some excellent steampunk stories. However, I think the net was cast a bit too wide. Some of the stories didn't seem steampunk at all, but low tech post-apocalyptic stories. If it doesn't have steam or a sort of Victorian flavor, is it really steampunk? I don't think it is. Enjoyed every story. They were all unique and fascinating, and most of them shockingly progressive considering the time period they tend to be set in. Highly recommended for any Steampunk fan. It certainly lives up to its name. It is a mammoth read, but worth the time and effort. I picked this up while I was writing my first Steampunk novel, hoping to get a glimpse into his mysterious world of amazing steam and clockwork powered inventions, and alternate universes where electricity was obsolete. I was hoping for grandiose descriptions, compelling characters, incredible machines, fantastical worlds, and grungy, sooty Victorian-Era stories. What I got was a little bit of that, but mostly it was other genres set in a steampunk world where you don’t see much of the steam. It wasn’t the greatest anthology but it was just enough. Just. What a great collection of stories! And what a lot of new authors to look out for now! There are a lot of very different Steampunk worlds here, including the African country of Everfair from Nisi Shawl, a Thai post-apocolyptic world from Benjanun Sriduangkaew, an Aztec maker of clockwork birds from Aliette de Bodard, and many more, with airships and mechanical creatures and fairgrounds full of marvels, a floating city full of opera houses, the Mongolian plains, the beginning of the film industry What a great collection of stories! And what a lot of new authors to look out for now! So I didn't finish this book. To me, the quality of the stories was kind of weak and some of them had only the most tenuous claim to steampunk. That'd be okay, if the quality of the stories was better. On my Couldn't Finish shelf. I greatly enjoyed reading all the stories in this volume. While not all of them were my style, I appreciated seeing how different authors approach the subject and do Steampunk in their way. I am trying to write a Steampunk story of my own so this rounded out some new perspectives for me. Engaging collection of enjoyable stories. As with any anthology, I found some to be better than others, but I liked most of them quite a bit. Varied selection of stories within the parameters. Liked Ken Liu's best. Like many Short Story anthologies, this book is uneven. Recommended by a friend, if you like the genre, I say give it a try.